Come and enjoy an evening of top quality entertainment with some of the UK's finest comedians and singers. Come and sing, catch jokes, drop foot and dance the night away with your loved ones on Sunday 8 June 2014. 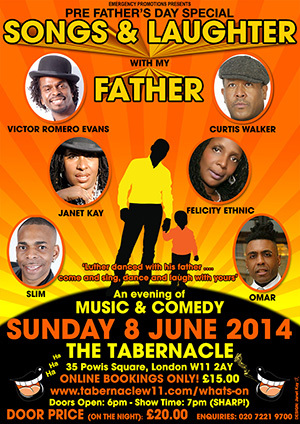 Info: Songs and Laughter With My Father takes place on Sunday, June 8th at the Tabernacle, 35 Powis Square, London W11 2AY, doors open at 6pm | Book online | Alternatively tickets can be purchased on the door on the night of the show.